Last month, a software update rolled out to European Samsung Galaxy S4 handsets that added a few new features, although it didn't include Samsung's enterprise-focused security system, called Knox. That update has finally hit U.S. shores and is starting its rollout with the Sprint variant of Samsung's newest flagship device, and this time it is complete with Knox. 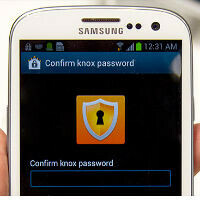 The Knox security suite has been delayed, which has frustrated some enterprise users who had wanted to start using their Galaxy S4s with their companies' BYOD programs, so this update should be good news in that respect. The other major addition in the update is one that Google has been trying to kill off for quite a while now: apps to SD. Galaxy S4 users will once again be able to move apps to their SD car, assuming the apps allow the option. The feature should help with the fact that Samsung's TouchWiz uses almost half of the internal storage of the 16GB S4, but it will still cause problems with apps that need to autostart or apps with widgets (which is why Google has killed the option in Jelly Bean after deprecating it for a while). Additionally, the update adds a few smaller features like a Smart Pause toggle in the notification panel, a new setting to tweak text legibility, a briefing app, and an SPDclient app. Status bar transparency also now works with custom wallpapers. According to the community at XDA, the update does also cause changes to the bootloader. There has been a Secure Boot Image added for use with Knox, but the bootloader itself still isn't locked and is still easily rooted. The update is being pushed out OTA right now and clocks in at about a 376MB install.